With interactive visualization, business leaders and other key decision makers create “what if” views of data, explore data implications real time, and understand data to scientifically inform talent decisions to accelerate achievement of today’s and tomorrow’s business goals. An organization’s people strategy is the single most critical plan for accelerating business performance. 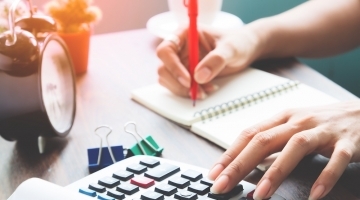 Yet 60% of organizations responding to Brandon Hall Group’s 2016 research survey said their approach was not at all effective or largely ineffective. When asked why, senior leadership said because the vast majority of hiring, managing, developing, mobilizing, and rewarding decisions are made on mere intuition. Just 16% of organization surveyed have matured their analytics strategy beyond gut feel and ad hoc reporting. And, a mere 7% are top performing organizations (Level 4 organizations) using data visualization to predict and prescribe talent actions and decisions that make a business difference. Data visualization goes well beyond static reports or spreadsheets. It presents data in graphical or pictorial format readily exposing customer behavior patterns, top talent turnover trends, employee engagement risks, potential dips in productivity, and other critical business and talent information. Level 4 data visualization organizations yield, on average, 60% higher returns on their business metrics than lower performing peers. While the uptake of analytics usage is recently on the rise, analytics impact opportunity lies not in the availability or historical reporting of data but rather in its visibility and ability to interact real-time with it – data visualization that is. Data pours into organizations in tremendous volumes. Mining billions and trillions of data elements can be overwhelming to an organization’s analysts, leaders, and employees and particularly when the integrity of the data is suspect. Despite the potential business value of data visualization, it is of zero value if the data is not of high quality. Level 4 analytics companies use a data governance process to raise awareness about why data quality is a business imperative, to document the quantifiable costs associated with the use of poor data, and to ensure clean, high-quality data avoiding subsequent issues tied to bad data. Graphical representations of data made possible by data visualization can highlight data outliers or errors more quickly than tables and spreadsheets filled with numbers and text. While removing outliers is essential before final analysis, analysis of the outliers themselves may reveal potentially valuable insights. Without data visualization, identifying outliers is extremely challenging. Analyzing data, identifying data patterns, and creating insights is not a task for the inexperienced. 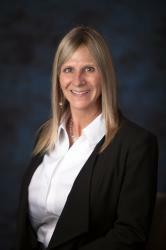 Managing data requires expert resources and automation tools. Organizations that assign dedicated ownership of data and data visualization, even if only in a part time fashion, outperform those without dedicated accountability. Poor data quality has a significant business cost – in time, effort and accuracy. On average, data analysts spend 20 to 60 percent of their time trying to understand, fix, or eliminate poor data. Organizations that use data governance, execute a process for spotting data outliers, and assign ownership of data to expert resources, completely eliminate – or at worst significantly reduce — the number of occasions they are plagued with bad data. Today, we have a visual trend on infographics. Infographics share information and are effective at showcasing a critical message. 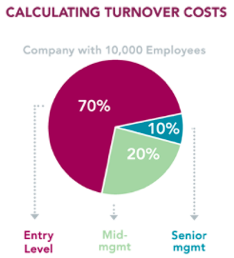 Take a look at the infographic below on turnover. It tells us that in large organizations, turnover costs are greatest in entry-level positions. This infographic does not, however, offer critical turnover insights like: (1) Is the turnover coming from a certain geography? (2) How is turnover changing over time? 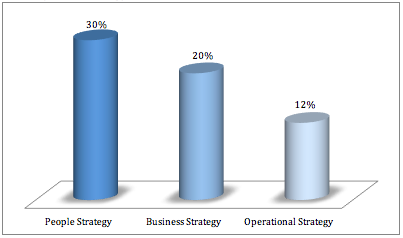 (3) Is our turnover pattern different among the three employee levels (i.e. is one increasing at a higher rate than the other)? This infographic and associated tabular reports and chart masks, even hides, the critical and actionable insights necessary to make intelligent business decisions. Now, take a look at the following data visual on turnover. The graphic above identifies specific employees who are at flight risk within the next 18 months, and offers attribute information on each employee. 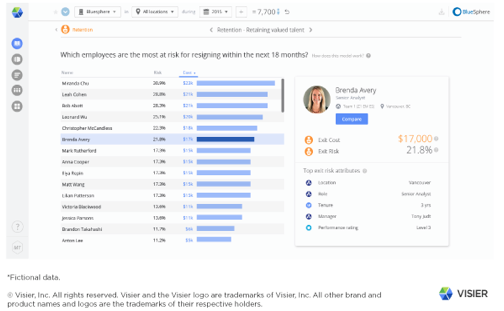 It offers imminent turnover information, suggests specific employees with whom targeted attention might be essential, and suggests locations and/or job roles that might be at risk and worthy of investigation. 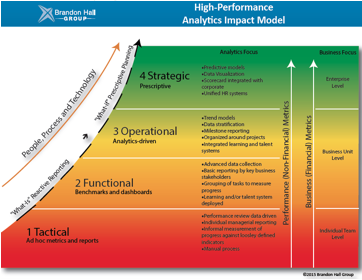 This data visual allows leadership to proactively explore organizational risk areas and execute risk mitigation plans before business continuity is threatened, unveils insights that lead directly to actionable business decisions, and puts talent decision-making power in the hands of the managers. Despite the business value that data visualization tools and technology offer, nearly half of organizations do not yet have workforce analytics tools or technology. Fortunately, however, 86% of organizations acknowledge the business risk and have plans to replace existing technology or acquire technology that ensures their ability to have better workforce analytics and data visualization capability. Data visualization is the key that turns “Big Data” into actionable data – data that provides the critical insights and understanding leaders need to make informed and intelligent business decisions.